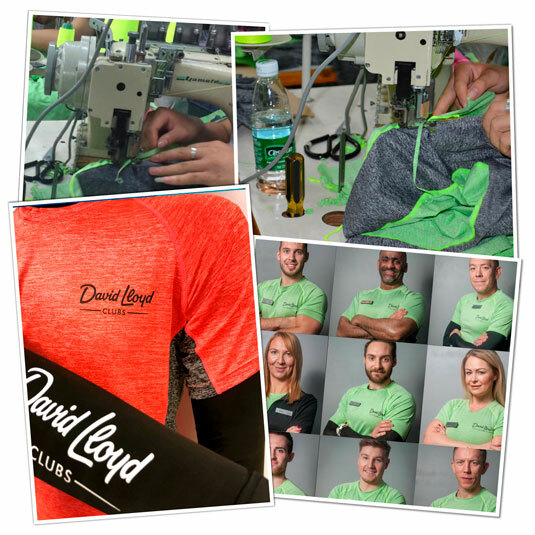 David Lloyd Leisure were looking for a Gym team uniform that would be modern, fashionable, functional, comfortable and in keeping with their premium brand. They wanted a uniform that their team members would enjoy wearing and perceive as the same if not better quality than many of the high street fitness brands of clothing. It was also important members could easily identify the team and differentiate between who was a PT and who was on the gym floor. The fabrics chosen were high end technical fabrics and designed around current fitness clothing trends and colours, whilst still keeping a close eye on the Brand guidelines. The uniform consisted of male and female fitted tops, base layer skins and male/ female bottoms – we specifically sourced a high end fabric for the male shorts and bottoms that was lighter weight and soft to touch whilst still keeping its technical properties. The female legging was again designed around both comfort and functionality. We manufactured a specific pantone dyed marl fabric for the tops to fit the pantone colours within the brand guidleines. The garments were then matched with a grey marl side panel so the uniform flowed from head to toe, an overlock contrast stitch was then used to give that modern look. As you can see the 2 colours chosen contrast beautifully and certainly give the clients visibility on the Gym Floor!